Beth Anderson, a former English as a Second Language teacher, thinks her students would have appreciated Ben and Noah’s big idea. An Inconvenient Alphabet is her first book. Born and raised in Illinois, she now lives in Colorado. You can visit her at BethAndersonWriter.com. Elizabeth Baddeley is the illustrator of the critically acclaimed and New York Times bestselling I Dissent: Ruth Bader Ginsberg Makes Her Mark, written by Debbie Levy. She also illustrated A Woman in the House (and Senate): How Women Came to the United States Congress, Broke Down Barriers, and Changed the Country; The Good Fight: The Feuds of the Founding Fathers (and How They Shaped the Nation); and An Inconvenient Alphabet. Elizabeth graduated from the School of Visual Arts in New York City with a degree in illustration and currently lives in Kansas City, Missouri. Learn more at EBaddeley.com. Ben Franklin’s attempt to reimagine the English language with completely phonetic spellings and an altered alphabet was one of his more quixotic inventions. Noah Webster also attempted spelling reform, but despite Franklin’s encouragement his efforts were also unsuccessful. This thought-provoking and entertaining exploration of these unsuccessful attempts to change the way we write will raise questions about spelling, American history, and the work of invention. Older students may be inspired to learn more about these colorful historic figures. Amusing illustrations vary from colorful spots to full bleed double page spreads, many of which include speech bubbles. Print-block style letters dance across the pages and interact with a diverse cast of dramatic characters. An extensive author’s note reflects on spelling and the evolution of the English language followed by a note about the research that went into the book. An illustrator’s note explains some of Baddeley’s choices. Bibliography. Source Notes. 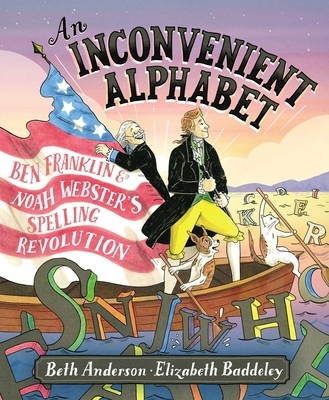 Anderson’s debut picture book details the origins of Noah Webster’s first American English dictionary and the struggles of Webster and Benjamin Franklin to help unify the new country through language in the 1780s. After laboring alone to streamline American English, the men meet and agree that the dawn of a new nation should also mean the dawn of a new kind of English for its citizens—one that would allow them to understand one another. “Some spoke like the king of England, others like backwoodsmen, and many barely spoke English at all.” The pair join forces over what proves a near-impossible task. Lighthearted illustrations by Baddeley (I Dissent: Ruth Bader Ginsberg Makes Her Mark) feature large, colorful letters that are juggled, balanced, passed around, and left in a crumpled heap as a befuddled citizenry questions and scorns the men’s proposals. Other touches, such as the changing expressions of the cameos hanging on Webster’s wall, keep the story engaging. With back matter that includes an extensive bibliography, this history succeeds in distilling the sophisticated subject of early American English lexicography into a comprehensible, lively read.